59 min 5 sec ago. 1 day 22 min ago. Last week, Obama said goodbye to Reid with another use of The Antiquities Act, creating another national monument out of 300,000 acres near Bundy’s compound. Heller, who once called the Bundyville horde “patriots” even as Reid was labeling them “domestic terrorists” unleashed a similar broadside as he did after Basin and Range. (Heller previously had written one of the those for-media-consumption-only letters to the president.) But Sandoval, while he used similar language as he had in 2015, also talked about what he had done once he realized the inevitability. Indeed, Sandoval’s assiduous attention to the pending national monument proclamation, with the White House and Reid, resulted in significant changes to the monument boundaries, thus mitigating the impact. But the real victory here is for environmental advocates and cannot be overstated: After many years of working on this, groups led by ex-Reidite Megan Jones with an assist from activists such as restaurateur Jenna Morton, ensured the last feather in Reid’s cap would be a Butte. And the man they really should thank, besides Obama, for ensuring it finally occurred was one Cliven Bundy. The first efforts to have Gold Butte designated as a National Conservation Area began a decade and a half ago. The first congressional foray came in 2008 when then-Rep. Shelley Berkley introduced a bill. A group called Friends of Gold Butte erected a website and began pushing for the national monument designation almost exactly nine years ago. Advocates thought they were slowly moving toward acquiring the votes when the Bundy standoff occurred in mid-2014 and then a few months later, the red wave hit Nevada. Interior Secretary Sally Jewell, wary of what might happen to BLM staffers after the Bundy confrontation, wanted nothing to do with Gold Butte. But ole Cliven proved to be an asset to the Gold Butte campaign. Advocates publicly asserted they still wanted legislation – they even met with some of the GOP members of the delegation -- but they had surrendered to the political realities. It was the Antiquities Act or bust. "Through extensive research and polling other political advocacy groups determined that amping up hits on Bundy and tying the Bundy doctrine of land management around every elected official's neck was the only way to beat them at their own game. Every move they made to hit Bundy was an attempt to ensure there was the political will for Obama and Jewell to do their job when the timing was right. Based on the election results in Nevada, I would say that we were successful in making sure that support for Bundy was toxic." Sometime after the Basin and Range designation, it became clear that Obama would consider Gold Butte, too, but only after the election. By mid-2016, seeing the writing on the wall, Sandoval got involved. He worked directly with the White House and with Jewell, working on boundaries and public safety issues. Sandoval’s relationship with Reid, which has been symbiotic during his tenure, also was pivotal. The first is of the original proposed Gold Butte boundaries. It includes private land and many of the Virgin Valley springs, about 360,000 acres. It also went right to the Bundy ranch doorstep, sure to be incendiary. The second is the northern part of the boundary, which eliminated most of the Virgin Valley Water District springs and rain gauges. Sandoval's proposed map also eliminated all of the private land, which was excluded from the final designation. The third map is the final designation, which is about 290,000 acres. This didn’t happen in a vacuum, either. In the months before this happened, nonprofit backers of the designation repeatedly brought up Bundy as a bete noire. And his name also was constantly raised by Ruben Kihuen in his ultimately successful race to defeat Horsford-slayer Cresent Hardy. And when Bundy was thrown in jail, it only armed Reid with more rhetoric throughout the year. 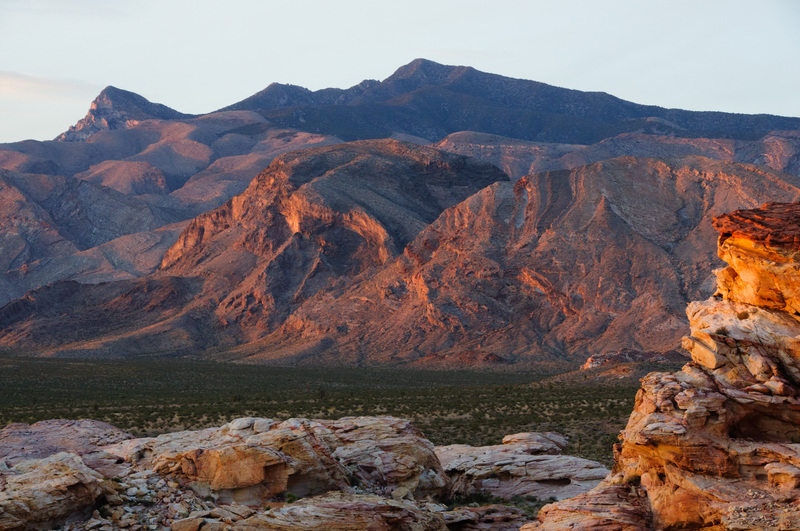 "There was a conscious decision to separate Gold Butte advocacy groups from the efforts of those working on holding politicians accountable," said Jones who led the coalition efforts and advised third-party groups on strategy. "On the coalition side we continued to push out our business support and economic voices but also began to more forcefully highlight the injustice felt by tribal voices who hold this land sacred for ancestral reasons. We also documented extreme cases of irreparable damage to the area to call on a sense of urgency for permanent protection." But with Bundy-sympathizers defeated in the blue oasis of Nevada, the backers quickly obtained letters of monument support from the newly elected delegation members – Kihuen, Sen.-elect Catherine Cortez Masto and Rep.-elect Jacky Rosen. And Reid, of course, let the White House know in the past-Nov. 8 world what would complete his legacy. What seemed inevitable after Basin and Range actually took a lot of work from Friends of Gold Butte and, to close the deal, Sandoval. Not surprisingly, many foes are calling on Trump to undo what Obama has done on national monuments. But it would be unprecedented and complicated. The real question: Would the political cost – to the president, to Heller, maybe others – be worth the attempt to unravel this hard-wrought designation? I bet I know what Cliven Bundy, the real architect of the Gold Butte national monument proclamation, thinks.